Captain America Reborn concludes. ComicBookResources has the preview of #5. Thought I'd share a comic I just read called Josh and Imp. Written by Jon Bernhardt and drawn by Diana Nock, it was made for an anthology that never got made. It's kind of a freeform exploration of the superhero lifestyle, riffing on the Batman and Robin partnership. With kisses. And grappling hooks. It's a bit dialogue-heavy, but it's worth it for the awesome ending. I think you'll like it. In response to a request made in the comments to this post... Mostly random panels, but a couple full pages, because they're too awesome to cut to a panel. Edit - added one more half page, from Villains United. So, yeah. I love Lori's powers just for the visual possibilities - well, and the rest, too, but the visuals are just truly awesome. From various issues of Birds of Prey, one of Day of Vengeance, and Helmet of Fate: Black Alice. Most from any issue is 3 and a bit pages from Helmet of Fate. Six scans of a Zoe: The Atomic Twentysomething story from the ol' school SLG book Babyhead Magazine. The comic never had more than one issue, which is a shame because I adored this one. Okay, I already let out a cursory squeal of joy at seeing "S. Simeon" on a mailbox Wally was making a drop at, in the DC Holiday special, but this took the joygasm to a whole other level. Since the theme today seems to be Wilson Fisk in the shower, I thought I would post a page from CIVIL WAR: WAR CRIMES. The issue was a one-shot to fill time while waiting for Mark Millar and Steve McNiven to finish the final two issues. 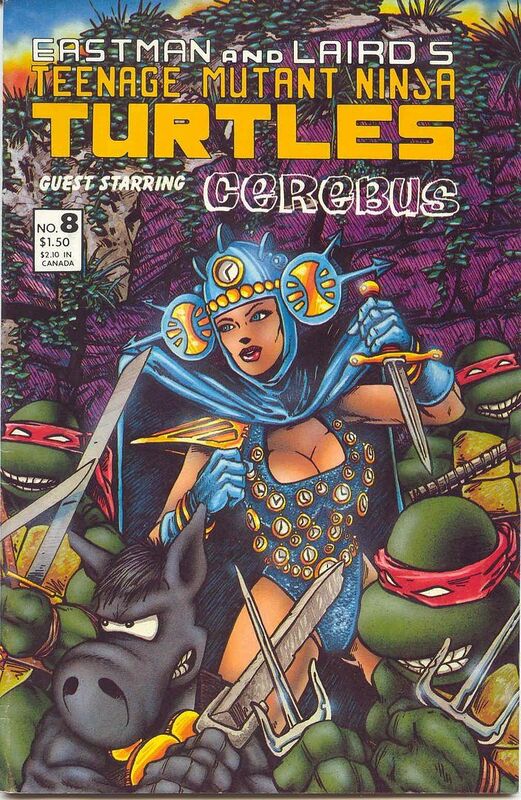 Those of you who didn't live through the 1980s might not remember this, but once upon a time, Teenage Mutant Ninja Turtles and Cerebus were, in many ways, the same comic book. Both were independently published black-and-white comic books whose title characters were anthropomorphic animals who possessed comically cartoonish physical features and predilections toward medieval weaponry, and both titles began as parodies of popular Marvel comics - Kevin Eastman and Peter Laird started out by riffing off Frank Miller's Daredevil, while Dave Sim was initially inspired by Barry Windsor-Smith's Conan - so in retrospect, it makes more sense than you might otherwise think that, in 1986, the two titles crossed over, in Eastman & Laird's Teenage Mutant Ninja Turtles (vol. 1) #8. Another fun fact that might surprise many modern comics fans? While Sim is now known primarily as That Guy, who devotes extended parenthesis-peppered essays to denouncing The Female Void for consuming, suffusing and leeching off The Male Light, there was actually a time when his work regularly exhibited an uncanny knack for comedy (yes, of the intentional kind, no less! ), and the following crossover between Eastman, Laird, Sim and Gerhard is just such a showcase of that talent. In the opening pages of this issue, Renet, an Apprentice Timestress to Lord Simultaneous, steals the Sceptre of the Sacred Sands of Time to travel to New York in 1986 (when this story was written), where she meets up with the Turtles. When Simultaneous shows up to bring her and the Sceptre back, the Turtles try to defend her, so to save them all from Simultaneous, Renet tells the Sceptre to take her and the Turtles "anyplace on this Earth before humans recorded time!" "Okay, now I know today is Tuesday, but what year is it?" "Hmm... I don't think we record that yet."